February 2008: The paperback edition's out! "The first true successor to Tracy Kidder's The Soul of a New Machine"
Why is software so hard? 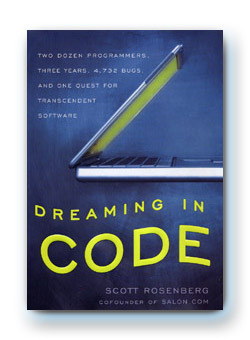 Dreaming in Code: Two Dozen Programmers, Three Years, 4,732 Bugs, and One Quest for Transcendent Software sets out to understand why, through the story of one software project -- Mitch Kapor's Chandler, an ambitious, open-source effort to rethink the world of e-mail and scheduling. I spent three years following the work of the Chandler developers as they scaled programming peaks and slogged through software swamps. In Dreaming in Code I tell their stories. The shelves of the world are full of how-to books for software developers. This is not one of them. I'm barely an elementary programmer myself. I wouldn't presume to try to teach the experts. And if my research had uncovered some previously unknown innovation or fail-safe insight into building better software, I'd be smarter to seek investors, not readers. So while I hope that programmers will enjoy this work, it is meant equally or more for the rest of us. It poses a question and tells a tale. Why is good software so hard to make? Since no one seems to have a definitive answer even now, at the start of the twenty-first century, fifty years deep into the computer era, I offer, by way of exploration, the tale of the making of one piece of software -- a story about a group of people setting their shoulders once more to the boulder of code and heaving it up the hill, stymied by obstacles old and new, struggling to make something useful and rich and lasting. Thanks for visiting this site for Dreaming in Code. You can read the excerpt or find out more about me. See what other people are saying about the book, or what comments other people have left here at this site. Send me some email if you want. And, if you like what you see, you can order the book right now from Amazon or Barnes and Noble, or find it at your favorite bookstore.